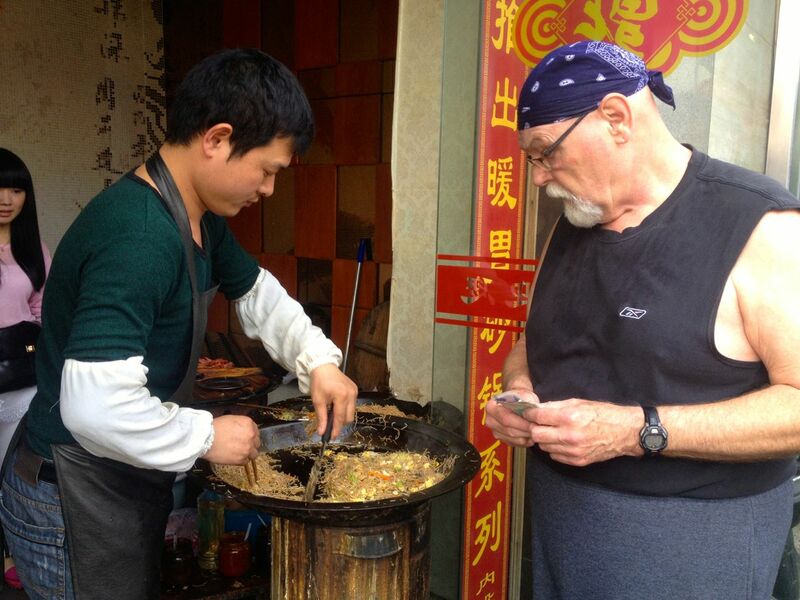 HANGZHOU, CHINA–July 8, 2014–In case those of you out there who are following our Asian escapades think that my wife and I are off on a non-stop adventure, I just want you to know that our lives still have more than a modicum of the daily grind. Our lives are still full of the normal administrative tasks to which we all must attend. For instance, on our return from our travels through Vietnam and Cambodia, I discovered that my bus pass was exhausted. Sort of. The pass actually has four slots, one of which is used for bus fare. But I had 200 yuan in one of the other slots reserved for bike rental security deposit. As the bus is our lifeline to everything here in Hangzhou, I needed to move that 200 yuan deposit into the bus-fare slot. It’s easy to do, if you can read traditional Chinese. It’s a major roadblock if you can’t. A nice woman in my wife’s bank made a call for us and then told us which buttons to press on the card interface at one of the ubiquitous bike stations in the city. We were to press number 2, then the button with a certain Chinese character, which she wrote for us. This would transfer the money from the security deposit slot to the bus-fare slot. At the bike station, we found the card reader and pressed 2, and sure enough, the 200 yuan appeared. Trouble was, we could not match the Chinese character that our helper wrote with one on the interface keypad. As it happened, a Chinese man was coming to rent a bike. I motioned to him to come over. He looked at the interface and, with a little pointing and a few simple words from us, figured out what we wanted to do and told us which button to press. Voilà! The 200 yuan transferred to the bus-fare slot. My wife repeated the process for her card, and we’re good to go again on the bus. After returning from Vietnam and Cambodia and before we once again laid in groceries, Char and I walked down the street to buy a morning breakfast of noodles with vegetables and eggs, and dumplings. Very handy, tasty, and inexpensive. Having taken a couple of days to decompress from our Southeast Asia travels, we felt the need to stock the refrigerator and get some food back into the apartment. So, with our newly recharged bus passes, we hopped a number 10 bus for a 30-minute ride to a shopping mall with a particularly nice grocery store. (By the way (BTW), busses in Hangzhou are almost always full (as in crowded, packed) during the day, so this was an arms-over-the-head-hanging-onto-the-stanchion ride for me. The thought of riding a packed number 10 with our heavy grocery bags compelled us to hail a taxi. For $2.75, we got a quick, more or less stress free ride to the apartment. I say more or less stress free because our taxi driver appeared to be an 18-year-old kid who seemed to be practicing for a career as a Le Mans driver. Accelerating toward oncoming traffic in the opposing lane in order to pass set that notion in my mind. We made it though, eh? Because my pharmacy benefit manager refused to give me a six-month supply of meds in February, I now found it necessary to call the pharmacy in West St. Paul to order another 90-day supply of meds. Of course, pick-up is the tricky part—too much of a hassle to trek 7,000 miles for the meds. But with the help of number 2 son, a care package is being assembled that will find its way here in 10 days or so. So now we have to make reservations to fly to Xi’an on August 5. Our overland crossing of Central Asia begins there. It’s easy enough to make the flight reservations, but way more difficult to prepare. We also have to send several boxes of clothing and other materials back to the states. We brought much more “stuff” for our five-month stay, which covered three seasons, than we could ever hope to lug with us across Central Asia. So we have to pare down to the bare minimum before we move on. I’ve been asked to repeat my seminar on dirty language for 120 Chinese English teachers in mid-July. Seems my first effort in May was quite a hit. So I am engaged in trying to enhance that lesson. Not sure how to do that. I’ve got about a week to come up with a lesson plan. We are preparing to travel to Japan during the last week of July, where both my wife and I have friends, although I have never been there. Char has, however, about 18 years ago when she traveled there with my daughter on a student exchange trip. She made several friends there with whom she has maintained contact. We are looking forward to seeing them again. And at last, the big question of the day—the one we all ask our partners every day—what’s for dinner? Yes, we did our grocery shopping, but we must still decide which meal we’re going to prepare. The daily grind—it’s always with us. But, come to think of it, there is this element of a non-stop (if somewhat challenging) adventure about it.